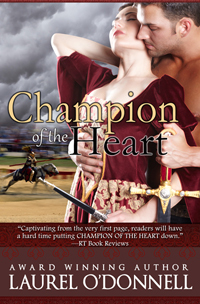 Our featured medieval romance novel for this week’s Medieval Romance Monday is Champion of the Heart by medieval romance author Laurel O’Donnell. At this point in my writing career, the paranormal was becoming increasingly prominent in literature and in movies. I was intrigued by hauntings and in particular haunted castles. I wondered why someone in the past wouldn’t use a haunted castle as a cover. In the medieval ages, people were terrified of the unknown and very superstitious. This is the backdrop for Champion of the Heart. I hope you enjoy this story! This entry was posted in Blogs, Medieval Romance Monday and tagged champion of the heart, laurel o'donnell, medieval romance monday. Bookmark the permalink.